Watch all of Andie's contest submissions and other talented Performers on the Megastar app. 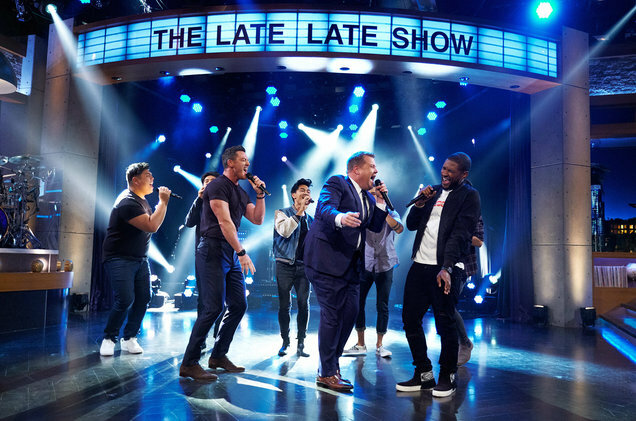 Usher and Luke Evans perform in a Riff Off with James Corden and The Filharmonic during The Late Late Show with James Corden on Oct. 12, 2017. Aspiring artists are invited to upload auditions to the Megastar app for a chance at the top prize. "Extra's" Mario Lopez caught up with Usher at Universal Studios Hollywood to talk about the new global app competition Megastar. The eight-time Grammy winner is an investor, creative director, headline celebrity mentor and judge for the world's largest crowdsourced talent competition. For the chance to let Usher and the world see if you have what it takes to win the $1 million, download the Megastar app here! With a long history of mentoring, Usher was the perfect fit for MEGASTAR's celebrity mentor to guide the contestants through the competition. The eight-time Grammy Award winner will oversee global talent search MEGASTAR, which offers international wannabes the chance to win $1 million. Usher will stop by Universal Studios Hollywood Tuesday, October 3, at the Globe Fountain to tell "Extra's" Mario Lopez all about the Megastar app. The eight-time Grammy winner is an investor, creative director, headline celebrity mentor and judge for the world’s largest crowdsourced talent competition. This innovative mobile competition, which officially launches today, will feature performers from around the world with a diverse array of talent competing to win $1 million. OAKLAND, Calif., Oct. 3, 2017 /PRNewswire/ -- Today, MEGASTAR announced the launch of their global talent competition with eight-time Grammy award winning superstar Usher as the Creative Director, Head Judge, mentor, and investor. MEGASTAR is set to be the world's largest crowdsourced talent competition. The innovative mobile competition features performers of any category from around the world competing to win $1 million, a role in a film produced by John Baldecchi, and a variety of small cash prizes. 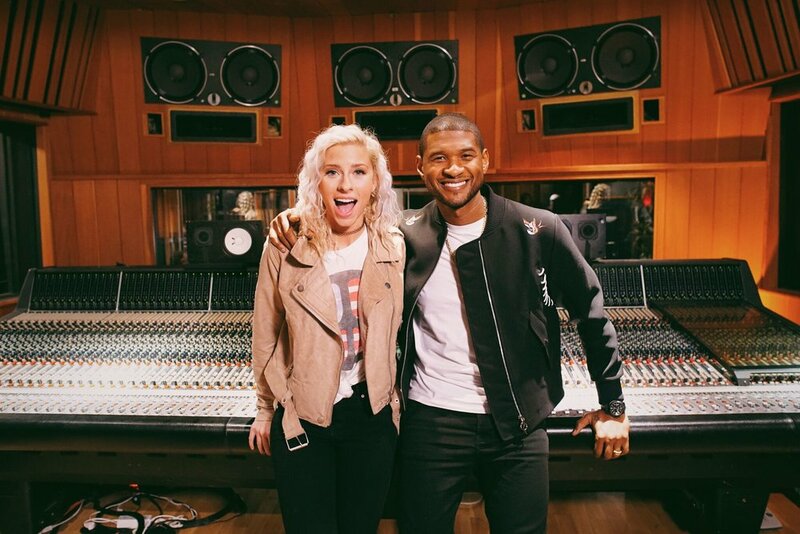 "We are absolutely delighted to have Usher invested in both the product and the outcome of MEGASTAR. His career spans over 24 years already, and he has inspired so many artists. He has so much experience, training and industry knowledge to impart on our Performers and his insights are invaluable to singers, dancers and performers in general," commented Managing Director/CEO and Co-Founder of MEGASTAR Dion Sullivan. MEGASTAR provides performers of all kinds with a global stage to showcase their talents and puts the audience in charge of who rises and falls. The Fans call the shots, share their voice and decide who should be the next MEGASTAR via voting on the MEGASTAR App. MEGASTAR is available to download for free on the App Store and Google Play. Our first worldwide competition is live and now open to audition submissions from residents of the US, Canada, Australia, Great Britain, South Africa, and New Zealand. For more information about MEGASTAR, visit the App's social channels on Facebook and Instagram. For complete audition rules, visit https://megastarapp.com/auditionrules/. Eight-time Grammy-Award winner Usher has been ranked by the Recording Industry Association of America as one of the best-selling artists in American music history, having sold over 65 million records worldwide. He has won numerous awards including eight Grammy Awards and was named the #1 Hot 100 artist of the 2000s decade. Billboard named him the second most successful artist of the 2000s, with his career-propelling 2004 album "Confessions" being ranked as the top solo album of the 2000s decade. Usher has attained nine Hot 100 #1 hits (all as a lead artist) and 18 Hot 100 top-10 singles. 2016 proved to be a big year for Usher not only in music but also in film and his philanthropic endeavors. Musically, Usher released his much anticipated eighth studio album entitled "Hard II Love," which has already spawned his 15th No. 1 single with the song "No Limit." Facebook (46 million), Twitter (12.3 million) and Instagram (6.7 million). MSM Corporation International Limited ("MSMCI") is a digital entertainment technology company that specializes in building and launching mobile digital entertainment products to audiences, with our first product (MEGASTAR) launching in the US, Great Britain, Australia, Canada, New Zealand and South Africa. MSMCI partners with local operators in non-English speaking markets to maximize the reach of its products and services globally. The first MEGASTAR competition launches in MSMCI's six core markets with the App available for download from the Apple and Google Stores. Additional MEGASTAR competitions will subsequently launch in various global markets via partnering and licensing agreements. MEGASTAR was founded by Adam Wellisch and Dion Sullivan in February 2014 and listed on the Australian Securities Exchange becoming MSMCI (ASX:MSM) in January 2016. The Company is currently headquartered in Sydney, Australiaand Oakland, California, USA. MSM Corporation International (ASX: MSM) announced on Tuesday that it had entered into an agreement with social media talent agency, Boomopolis, to engage 12 of its top social media performers as part of the marketing program for the launch of the worldwide Megastar competition. Boomopolis has a combined network of over 200 million fans and followers, and its performers will enter Megastar and leverage their existing social media presence to direct promotional posts to their combined audience of more than 15 million social media followers throughout the competition, effectively boosting Megastar’s total audience reach to more than 50 million social media followers. Read More. The much anticipated launch of the Megastar App in UK and South Africa occurred on June 30 and July 1 respectively, a major milestone for parent company MSM Corporation International (ASX: MSM). MSM is a leading digital technology and entertainment company and its flagship product is Megastar, a global mobile first talent competition featuring performers of any category competing to win US$1 million, a role in a film and various other prizes. Winners are chosen by fans voting in the competition through the Megastar App. As the similar format television hit, The Voice hosted its grand finale last night, another fan based voting competition — only one that captures a digital audience — made its entry onto the big stage. Testing in Great Britain has finished with the first audition heat completed and key engagement metrics (daily time spent in-App) rising by 16%. The British market has a target audience of more than 11.6 million and the South African market has a population of over 55 million with more than 40% penetration of smartphone users. Read More. A trio of Australian models that became an internet comedy hit have been signed to host a new online talent show designed for mobile phones. Shae-Lee Shackleford, Lana Kington and Madison Lloyd, who have had more than 100 million YouTube views as members of SketchSHE, were announced Wednesday as the hosts of worldwide talent contest Megastar. The program is the first venture for MSM Corporation (MSMCI), which raised $7 million a year ago in a reverse takeover of mining company Minerals Corporation and now bills itself as a “digital incubator”. Sophie McGill, Asia-Pacific executive director of MSMCI said SketchSHE was perfect for the gig after online popularity of their comic YouTube lip sync videos spilled over to mainstream media. “Because the group has appeared on the Ellen Degeneres show and Good Morning America as well as in Australian media on programs such as Sunrise, we feel they have the global appeal, skills and visibility integral to the launch the next stage of talent competitions,” she said. ASX-listed MSMCI is touting Megastar as the first wide-appeal talent competition to cross over from television to smartphones, promising to combine “social media, gaming and live entertainment” into the experience, with a top prize of $US1 million as the carrot for contestants ... Read More.